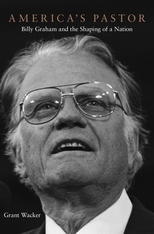 During a career spanning sixty years, the Reverend Billy Graham’s resonant voice and chiseled profile entered the living rooms of millions of Americans with a message that called for personal transformation through God’s grace. How did a lanky farm kid from North Carolina become an evangelist hailed by the media as “America’s pastor”? Why did listeners young and old pour out their grief and loneliness in letters to a man they knew only through televised “Crusades” in faraway places like Madison Square Garden? More than a conventional biography, Grant Wacker’s interpretive study deepens our understanding of why Billy Graham has mattered so much to so many. Beginning with tent revivals in the 1940s, Graham transformed his born-again theology into a moral vocabulary capturing the fears and aspirations of average Americans. He possessed an uncanny ability to appropriate trends in the wider culture and engaged boldly with the most significant developments of his time, from communism and nuclear threat to poverty and civil rights. The enduring meaning of his career, in Wacker’s analysis, lies at the intersection of Graham’s own creative agency and the forces shaping modern America. Wacker paints a richly textured portrait: a self-deprecating servant of God and self-promoting media mogul, a simple family man and confidant of presidents, a plainspoken preacher and the “Protestant pope.” America’s Pastor reveals how this Southern fundamentalist grew, fitfully, into a capacious figure at the center of spiritual life for millions of Christians around the world.